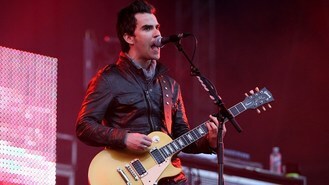 The South London four-piece went straight to the summit with their new release, Bad Blood, after going head-to-head with veteran Welsh rockers Stereophonics, said the Official Charts Company. Stereophonics' album Graffiti On The Train crashed in at number three, while recent Brit award winner Emeli Sande was knocked off the top spot to number two with Our Version Of Events. Singer Dido's first album in four years, Girl Who Got Away, went in at five, just behind Bruno Mars with Unorthodox Jukebox at four. Another new album, Sing To The Moon by Laura Mvula, finished at number nine to complete four new entries in the top 10. Rock legend Jimi Hendrix's new archival album, People, Hell And Angels, also sneaked into the top 40 at 39. Meanwhile, Justin Timberlake held on to the top spot in the singles charts for a second week with Mirrors. The American singer beat Bruno Mars' single When I Was Your Man into second spot, while Bastille's single Pompeii fell one place to number three. Pink featuring Nate Ruess climbed six places to number four, while Macklemore and Ryan Lewis's Thrift Shop fell one place to five. Disney star Bridgit Mendler had the highest new entry with her debut single Ready Or Not, which finished at seven.